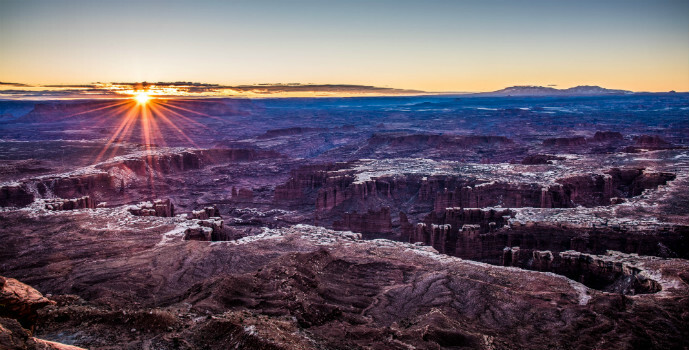 Canyonlands is the largest national park in Utah. It is divided into four districts: Island in the Sky, The Needles, The Maze and the Colorado and Green rivers. 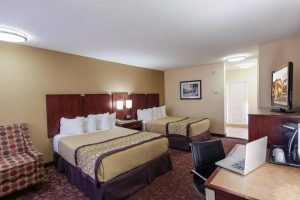 The diverse landscape includes towering sandstone cliffs, deep canyons, winding rivers, and stunning vistas. 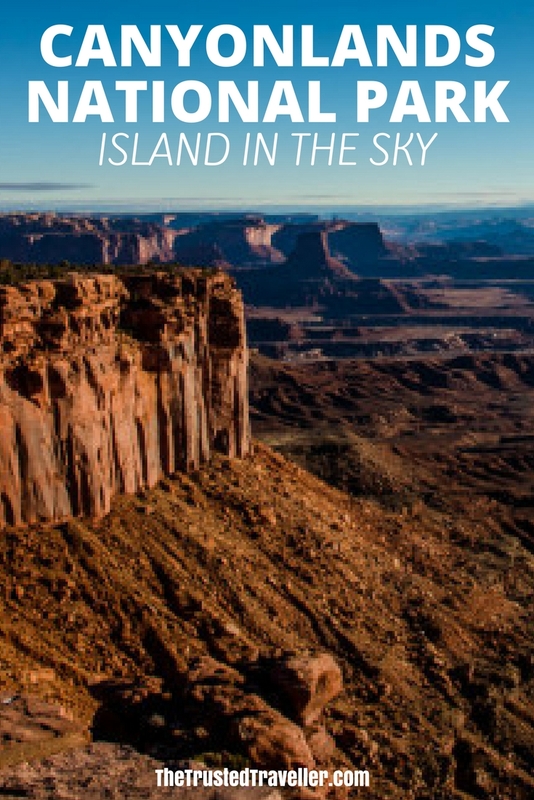 Canyonlands Island in the Sky is the easiest way to see this National Park. 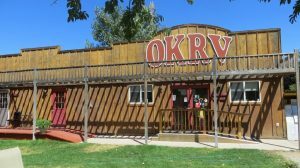 It is only 32 miles from Moab, Utah and offers spectacular views along the paved scenic drive; hiking trails; four-wheel-drive roads and back-country areas for day or overnight trips. The Island in the Sky rests atop a massive 1500 foot mesa. 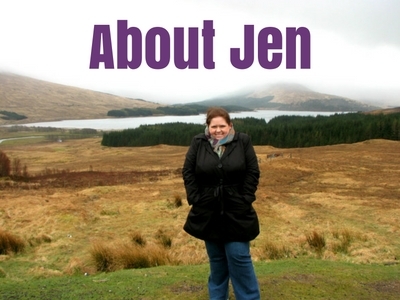 Visitors can often see over 100 miles in any given direction from the many viewpoints. The panoramic landscapes encompass thousands of square miles. Mesa Arch is one of the most popular sites in the park. The parking lot and trail-head are right off the main road. The 0.5 mile loop trail is easy and travels across slick-rock and dirt marked by stone cairns and driftwood. The arch is perched right on the edge of a sheer cliff so watch children carefully here. Be sure to see the Washer Woman rock feature through the arch. 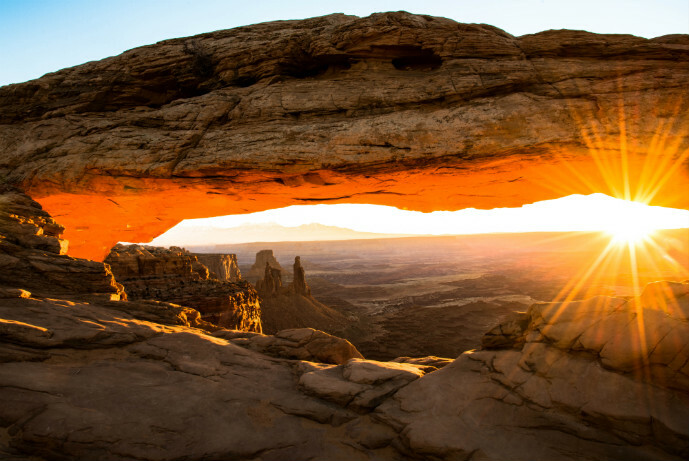 If you want to see this arch at sunrise, be prepared to share the scene with many photographers and other visitors. Arrive early to get a good spot to photograph the event, and don’t rush off too early as the red glow under the arch lasts a long time. You may get the arch to yourself after everyone leaves! Why do they call this place Canyonlands? The sweeping scene at Grand View Point provides the answer. The path from the parking area is fully paved and accessible for the first 300 feet to the overlook. Just beyond this paved platform, the trail makes a descent down a stone staircase. The trail from this point is a mix of dirt and cairn-marked slick-rock for 2 miles round trip. Do not get too close to the edge and be sure to watch children along this trail. The breathtaking view from this overlook shows the Green River in the distance winding through the canyon it created. The vista stretches for a hundred miles to the horizon. You can see the White Rim Trail below and may even see a jeep traveling along the route. 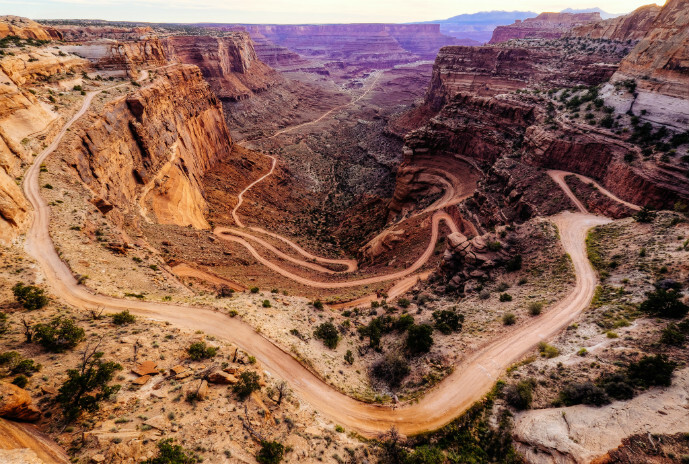 The view from the Shafer Canyon Overlook is beautiful, but the most amazing thing is seeing the road that hugs the steep wall as it travels to the canyon floor. Walk a short distance from the parking area for a better view of the winding road and canyon. If you’re lucky, you’ll see a vehicle or bicycle traveling the route. 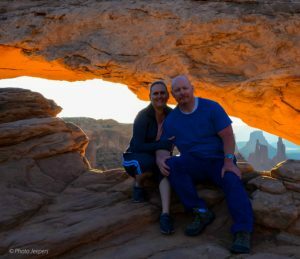 Or better yet, those with a high clearance/4WD vehicle can drive down the Shafer Trail to the White Rim Trail and explore Musselman Arch. This wheelchair accessible overlook is along the edge of sheer cliffs 1,000 feet high. The vast landscape of cracked sandstone stretches to the horizon. Don’t forget to turn around to see the view behind you as well. The scenery is breathtaking. 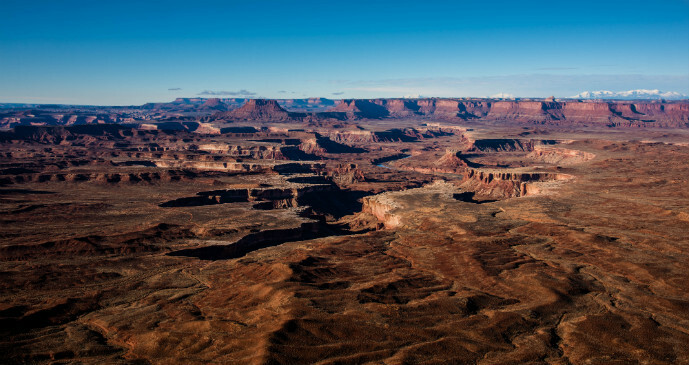 Canyonlands is geologically comprised of layers of sedimentary deposits from ancient seas, rivers and winds. Upheaval Dome has a different geology from the rest of the park. The rock layers are dramatically deformed and pushed upward to create a circular dome. The 1.7-mile round trip hike visits two overlooks along the rim of this three-mile wide 1,000-foot deep crater. 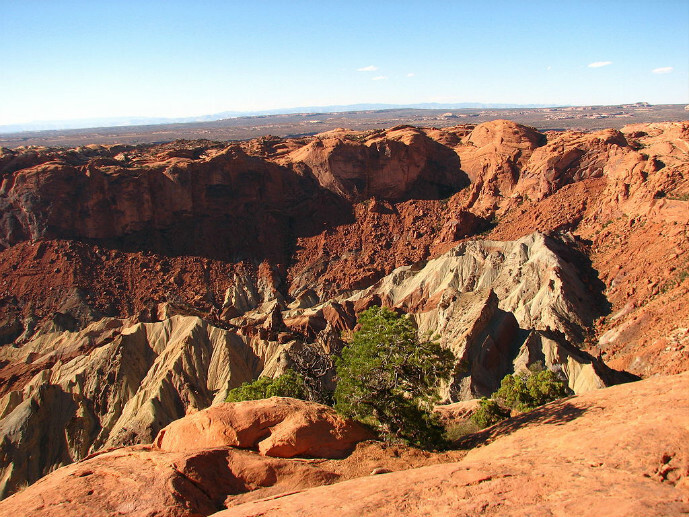 Learn about the two theories geologists have for what caused Upheaval Dome at the illustrated panels at the overlook. The trail to the top of scenic Aztec Butte is 1.7 miles round trip. It leads to expansive views of Trail Canyon, the Island in the Sky mesa and beyond. The climb to the top of the butte is steep and includes some difficult sections. Hikers should be comfortable ascending steep slick-rock pitches and scrambling up and down ledges with some exposure. This trail is not recommended for anyone with a fear of heights. The spur trail at the .3 mile mark that climbs the smaller dome is a good alternative for hikers looking for a shorter and easier hike. This trail leads to two granaries tucked in an alcove. Dead Horse Point is a small Utah State Park just north of the Island in the Sky district. 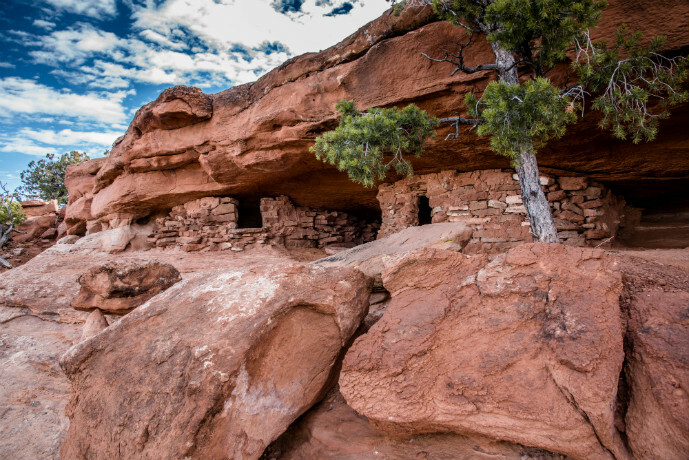 Due to it’s proximity to Canyonlands, it is included in this list. It is reached by a 4 mile side road off the main road to Canyonlands, just before entering the national park. The legend is that local cowboys rounded up some wild horses and corralled them on the plateau. The horses were left too long without water and all died of thirst. The area became known as Dead Horse Point. You’ve heard the expression ‘A million dollar view’ – the view here won’t cost you that much, but worth every penny of the entrance fee!. Stop at the pullouts and walk the trail along the edge of the rim to enjoy the scenic vista. The view towers 2,000 feet above the goose-neck bend of the Colorado River. The landscape at Dead Horse Point cannot be seen at any overlook in Canyonlands just to the south. At each overlook in the park, you may look down and see a dirt road at the bottom of the canyon and wonder who drives the road and where it goes. The 100-mile White Rim Road runs around and below the Island in the Sky mesa top. 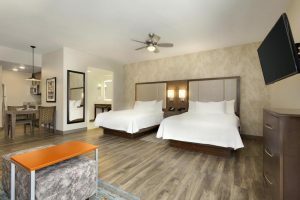 It provides a more intimate experience to enjoy the white rim canyons, Musselman Arch and Colorado River Goose-neck to name a few points of interest. Trips usually take two to three days by four-wheel-drive vehicle or three to four days by mountain bike. Permits are required for all trips on the White Rim road. 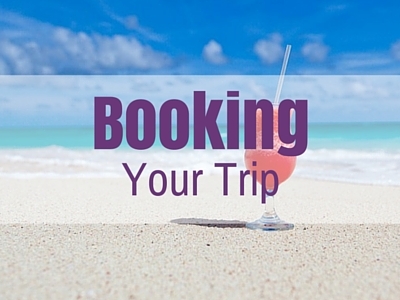 This is one adventure where preparation and planning need to be done well in advance. 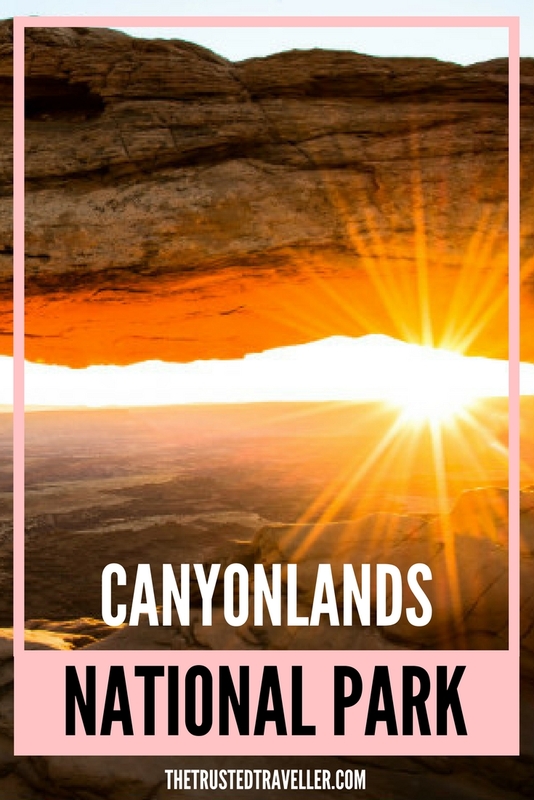 Canyonlands has hundreds of miles of four-wheel-drive roads that access campsites, trail-heads, and viewpoints in the park’s back-country. Understand the guidelines for off-road travel in the park. Research your route before attempting as roads range in difficulty from intermediate to extremely technical. 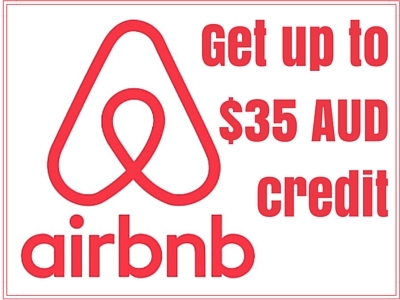 Most vehicle rental agreements restrict vehicles to paved roads. 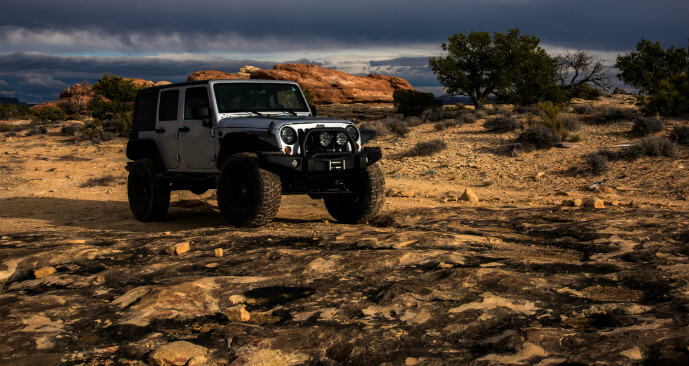 Contact one of the many Jeep rental outfitters in Moab if you want to experience off-road driving. Follow their advice and only explore the trails they recommend based on your off-road driving experience.